Wine of Bordeaux, France. Overlooking the Dordogne river, the renowned St Emilion vineyard offers a unique style of wine from the Bordeaux region. The cultural landscape of the Saint Emilion vineyards has gained a place on the UNESCO list of World Heritage Sites. This vintage is a blend of Merlot and Cabernet Franc grapes. This is an elegant and well balanced wine with ripe red berry fruit flavours and supple tannins. 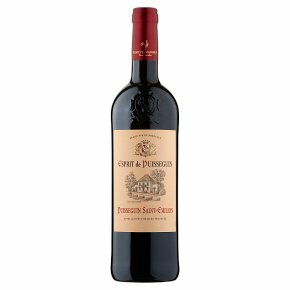 Esprit de Puisseguin St Emilion will enhance any good meal but is at its best with grilled or roasted red meats and rich creamy cheeses.